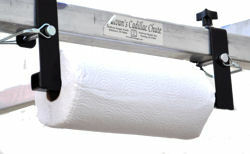 Sullivan's Paper Towel Holder [PTH] : Highland Livestock Supply, Ltd, Products for all of your show animals! The Paper Towel Holder conveniently attaches to any Sullivan Cadillac Chute. It makes paper towels easily accessible where you need them.